For each of the past twelve years, Neuse Realty has surveyed all sellers and buyers about their experience with our firm. 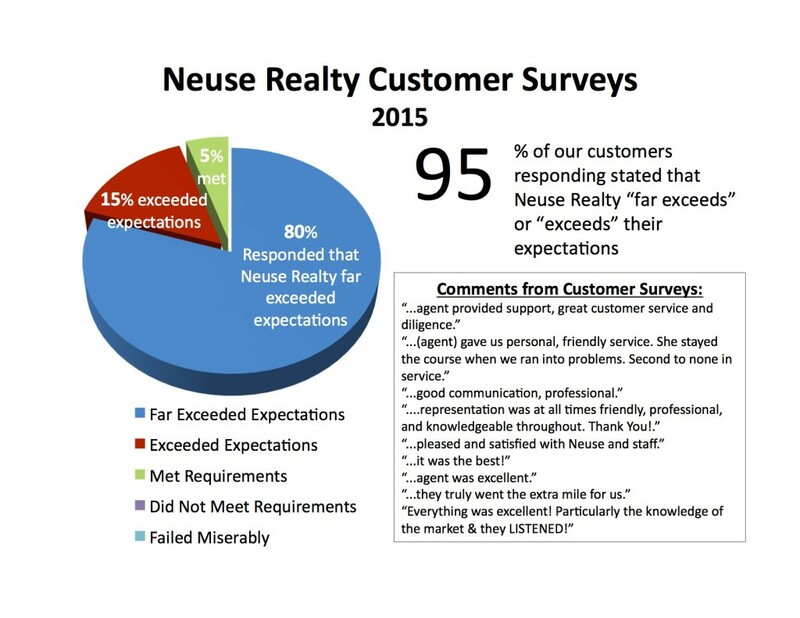 This year, over 95% of the responses to 12 questions about various aspects of the transaction stated that “…Neuse Realty far exceeded or exceeded their expectations…”. In order to better serve our customers, we would greatly appreciate it if you would take a few moments to let us know how we are doing. What do you like about Neuse Realty, and in what areas do we need to improve? Your continued satisfaction with Neuse Realty agents and services is extremely important to us, so we hope you take this opportunity to tell us what you think. What specifically could Neuse Realty have done (or should we do) for you to improve your ratings of us next time? What did you like most about working with Neuse Realty that you wouldn’t want to see us change? How did you find our company? Can we add you to our blog list? May we use your comments publicly?